THE WOMEN’S CONCISE GUIDE TO A HEALTHIER HEART. 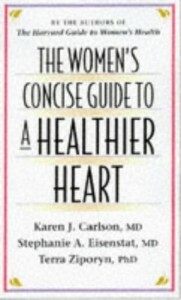 Co-authored with Karen Carlson, M.D. and Stephanie Eisenstat, M.D. Cambridge: Harvard University Press, 1997. Winner of a 1998 National Health Information Award in the book category of health, promotion/disease and injury prevention information. This award is presented by the Health Information Resource Center to recognize the nation’s best consumer health information programs and materials.